Joseph Allen Young was born in New York City on March 25, 1907. He entered the United States Army in 1924 and served from that time until 1928 with the 35th Infantry at Schofield Barracks, Territory of Hawaii. From 1928 to 1945 he served as First Sergeant, in a Military Police Company in North Ireland, United Kingdom. From 1946 to 1959, he served as a recruiter, an instructor for Reserve Officer Training Corps (ROTC) classes and as Club Non Commissioned Officer (NCO) for Officer's Clubs in Pennsylvania, Colorado, Connecticut and in the Panama Canal Zone. Sergeant Young retired from active duty in 1959 as a Senior Master Sergeant, United States Air Force, and, as a civilian, managed Officer's and Enlisted Men's Clubs for the United States Air Force and the United States Navy in the Panama Canal Zone and in California. 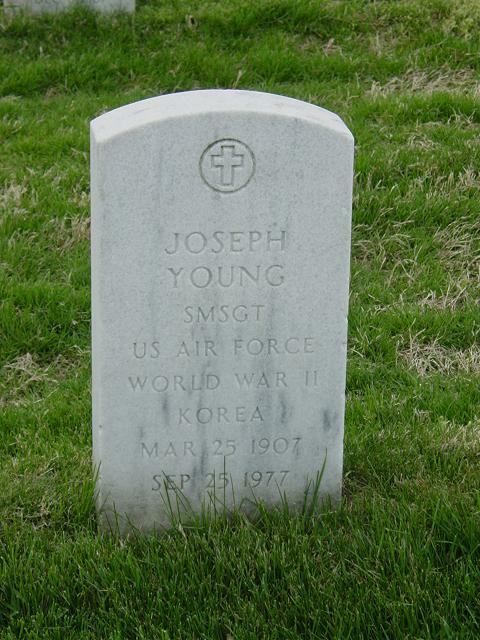 Sergeant Young died in Miami, Florida, on September 25, 1977 and was buried with Military Honors in Section 67, Grave 2896, in Arlington National Cemetery.